For nearly two decades, law enforcement agencies across the state have been supplementing their budgets by seizing cars, jewelry and other property when they make arrests. But under a new state law that took effect this year, they will no longer be able to confiscate property or sell that property without first obtaining a criminal conviction. “Police shouldn’t be able to ‘sweep and keep’ your private property simply by saying they suspect a crime connection,” said Sen. Holly J. Mitchell (D-Los Angeles) in a statement following the governor’s signing of Senate Bill 443 in September 2016. Under the new law, police agencies can no longer take advantage of federal laws of evidence that allow unlimited civil asset forfeiture without first getting a conviction. It prevents law enforcement agencies from permanently seizing property valued at under $40,000 until a suspect is convicted of a crime. Police departments across the state lobbied against the law, arguing that the fallout would be a hit to their budgets and making it harder to invest in needed resources. “Small police agencies rely on asset forfeiture for necessary equipment and training,” Vernon Police Chief Daniel Callegos told EGP this week. With public safety making up about half of most city budgets, proceeds from asset forfeitures – often money used by drug dealers or jewelry used as part of a transaction – have allowed police departments to upgrade their equipment without adding to already tight budgets. 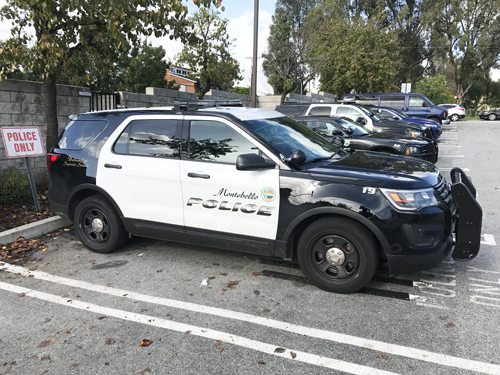 In Montebello, the police department averages $1.2 million in asset forfeiture proceeds every year. The funds can be used to pay for police overtime and new police vehicles, even though the city is again facing a budget deficit. According to Montebello Police Capt. Brad Keller, funds from asset forfeitures have been used to purchase nearly every marked police vehicle in the department – which cost about $45,000 a piece. “If we didn’t have those funds the city would have to pay for those new cars” using other revenue, Keller says. While there were already state laws in place prohibiting the practice, many local police agencies were able to get around them by partnering with federal law enforcement agencies, such as the ATF, Alcohol, Tobacco, Firearms and Explosives, and the DEA, Drug Enforcement Administration, to take down criminals in their jurisdiction. Cities would assign a narcotics detective to the federal task force in the hopes of bringing back funds. Those partnerships allowed the local agencies to receive an equitable share of the proceeds from cash or property confiscated through the course of a criminal and often narcotics-related investigations. Callegos pointed out that while those types of cases can bring in thousands of dollars to a department, it sometimes takes years for the local police agency to see the money. Vernon’s police chief says reducing or eliminating the ability to participate in the equitable sharing system will have a harmful impact on the region as a whole. Keller agrees. He told EGP that the joint federal-local task forces and asset forfeitures have been a valuable tool in reducing drug activity, not just in Montebello but in surrounding communities as well. He added that while many narcotics cases originate in Montebello, nearly every case leads detectives outside the city. “Our goal is to get drugs off the street, find the individuals responsible and seize their assets to take their power away,” Keller said. Between 2000 and 2013, nearly $670 million in private assets were seized through civil asset forfeiture, according to Sen. Mitchell, who cited the American Civil Liberties Union’s findings that most of the seizures took place in communities of color. Mitchell said the law will ensure that property seized – prior to a conviction – is returned to those communities with the fewest assets. She rejected the argument that ending the practice would essentially allow criminals and their accomplices to hold on to ill-gotten gains, which supporters of the change in the law said should only happen after a person has been convicted and it can be proven that the assets are the result of criminal activity. “This law won’t protect the drug lords that police say they’re after, but will cut down on the number of folks in poor, black and brown neighborhoods subject to ‘confiscation and conviction,’” Mitchell said. Is suspicion of being involved in drug sales reason enough for law enforcement agencies in California to be able to seize a person’s property even if they haven’t been charged with a crime? Apparently, many police departments across the State think so and have used the questionable rationale to seize cars, cash and other property to augment their budgets. Even worse, in situations where charges were never filed, seized goods and cash are often never returned. We don’t believe it’s proper or even healthy to allow the practice of prematurely seizing someone’s property without proof of wrongdoing and conviction in a court of law. The seizing of a person’s property on the mere suspicion that drug money was used to purchase or use the property is unjust and must stop. A bill by Senator Holly Mitchell (Dem.- LA) and David Hadley (Rep. -Manhattan Beach) proposed to do just that. The bill, already approved by the Assembly Public Safety Committee, would only allow property to be confiscated if the owner is convicted of a crime. We find this bill to be a good solution to what has become too common a practice at some police agencies. An action, that has in many cases caused undue deprivation without any remedy or recourse. We understand that police budget have been strained and that property seizures have boosted budgets cut made during tough economic time, but that’s not reason enough to allow the practice to continue. While we are not against seizures per se, we think those actions should only take place after a person has been convicted and there is sufficient proof that the property being seized is tied to the wrongdoing. EGP urges State Senate and Assembly members to pass Mitchell and Hadley’s bi-partisan asset seizure bill, and for the governor to sign the bill when it crosses his desk.